The door is hinged for added security. This model comes with a stylish gable roof. A very popular shed as it comfortably fits into most suburban backyards and has a very attractive price tag. Absco Premier Garden Sheds are designed for maximum strength and manufactured from low maintenance ribbed steel sheeting for added security. It is a very popular shed as it comfortably fits into most suburban backyards and has a very attractive price tag. 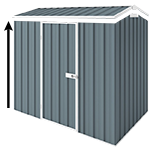 This 1.52m x 1.52m x 1.95m single door Colorbond shed is a versatile shed which can store a range of household goods such as garden tools, outdoor sports equipment and more. This Premier Garden Shed is a great addition to your home. It is engineered to withstand winds of up to the wind rating of N2 (147km/h).